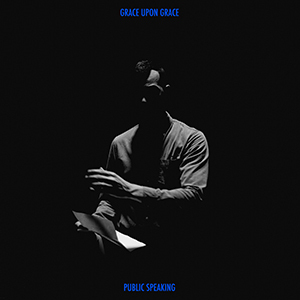 Brainwashed - Public Speaking, "Grace Upon Grace"
Public Speaking, "Grace Upon Grace"
Close on the heels of last year's Caress, Redact, the latest work from Public Speaking’s Jason Anthony Harris (along with some friends) is an even further refinement of his deconstruction of soulful pop and R&B sounds. With equal measures vocals, piano, found sounds, and synth noises, he shapes these disparate elements into catchy songs, albeit within a depressing and bleak context. The most striking development on Grace Upon Grace is the fact that each piece is, at its core, composed for just vocal and piano. Harris intentionally wrote the album this way, a method that is not necessarily associated with creating what can be rather challenging music at times. However, this really just serves to solidify Harris' continuing growth and evolution as not just a sound artist, but also as a songwriter. Running through the record is a thematic structure linking the five songs too, namely the intersection of politics and religion and the fanaticism associated with both (so, very timely). The opener "Backbone" exemplifies this stripped down approach right from the opening of droning electronics, snappy beats, and bass guitar. Soon Harris' vocals and piano take the forefront, nicely accented by skittering electronics all about, later even featuring a bit of trumpet from Jon Mizrachi. For its unconventional structure, it is a rather simple arrangement, capturing the sadness of the current political climate perfectly. "Trespass" is another of the more skeletal works, built around found sounds and strange noises layered together into effective rhythms. Here Harris' voice is accompanied by that of Sophie Chernin as well, creating a strong duality of tone that complements the jerky beats and found sound collages rather nicely. For other songs, however, Harris’ arrangements are a bit more complex. The electronic rhythms, bass guitar, and vocals all appear again on "Music of the Victors" as well, but in a greater complexity and richer mix. There are more layers of instrumentation, even some erratic electric guitar (courtesy of Zach Ryalls) added that fleshes out the sound even more, building to an almost jazzy conclusion to the piece. "The Most Dishonest People in the World" is more about up front, dramatic vocals and jerky piano at first, then blended heavily with skittering electronics to make for a more dissonant piece, but one that still feels loosely grounded in conventional songwriting and composition. The album culminates with "Burnt Offerings", leading off with squalling noises segueing into subway field recordings before locking into erratic beats and piano. The arrangement is unconventional, mostly built upon piano, drum machine, and found sounds, but Harris makes it work cohesively, mixing together and delivering a strong, memorable chorus while ending the song on a random, erratic note. For those who are not necessarily fond of vocal heavy music, or who want to hear more of the eccentricities of the music, the second half is simply an instrumental mix of the five songs that, while interesting, are not as strong as the vocal versions. As Public Speaking, Jason Anthony Harris is carving out a nice niche for himself, blending the worlds of more conventional R&B songwriting with abstract, very avant garde structures and instrumentation that seem at odds with each other, initially. It is a strange pairing to be sure, but it works brilliantly, no doubt because of Harris' skills in mixing and instrumentation, but also a strong voice. Conceptually I found the album to be a bit of a downer overall (not surprising given the context and its all too real appropriateness for 2017) but it is so adeptly executed that I could not help but enjoy Grace Upon Grace, even if it does little to lighten the mood.